Awesome for close quarter battles! The Tippmann 98 Crossfire CQB is a short, powerful paintball sub machine gun and precision Red Dot Scope that is amazing for close quarter fighting. This package features the reliable Tippmann 98 custom paintball marker, 1x46 red dot scope, 3 inch barrel and carbine stock for a low price. Nothing is more exciting in paintball than stalking your opponent in a close quarter battle. The intensity of playing is much higher when your enemy is right in front of you; fighting in a short range requires a fast action, accurate and reliable paintball marker. 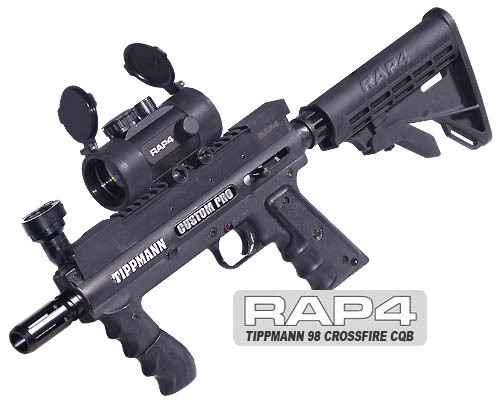 If you want a close quarter battle to be as real as it gets, use the Tippmann 98 Crossfire CQB. Made for fighting in short ranges, this paintball sub-machine gun will astound you with it’s accuracy and power - enough to send plenty of paintballs down the field as well as close. Built upon the reliable Tippmann 98 Custom Pro, the Crossfire CQB has a great balanced feel and nice weight; it's easy to carry, not too heavy but heavy enough to feel like a real gun. The receiver on all Tippmann 98's are die-cast aluminum so sturdyness is never a problem; these guns can take serious beatings and keep on shooting well. Remember, the 98 Custom also has the ability to accept a Response Trigger System or electronic trigger for the most realistic and fast action. The removeable foregrip on the Tippmann 98 is perfect for stabilizing your shots for aggressive waist level shooting. Take the Tippmann 98 Crossfire CQB and use it to rule close quarter fighting as the frontman of your team! With it's compact size, the Crossfire CQB also makes a great back-up marker, carried around your chest or back with a tactical sling. This gun is light and compact enough to be carried on your back, still allowing full movement, running and jumping; use it as a secondary weapon to be pulled out for close enemies or when your primary weapon runs dry. Buy the Tippmann 98 Custom Crossfire CQB from ChoicePaintballGuns for the lowest price on the internet. We also have a great selection of accessories to make your CQB sub machine gun even more realistic.